With consistent obligation towards excellence, we have been engrossed in delivering Manpower Supply Service. Due to our proficiency of this industry, our firm is occupied in rendering Man Power For NDT Service.These services are accomplished by industry capable professionals, who have affluent understanding of this realm. Furthermore, we render this service at nominal prices. Being a leading firm in this industry, we are offering a high quality range of Fire Manpower Supply Service. We also have with us extensive experience in understanding and meeting the Commissioning Assistance in LPG Pipeline with fire tenders. Our past experience includes having supplied fire tenders with crew for commissioning assistance for "JAMNAGAR LONI PIPE LINE" of GAS AUTHORITY OF INDIA LTD. and ESSAR OIL LTD. for meeting their refinery project needs at Jamnagar. 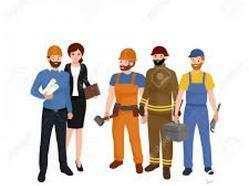 Manpower Supply Includes Engineers, office Staff, Skilled, Semiskilled & Unskilled manpower.